Andrea Smith is a co-founder of Incite! Women of Color Against Violence and the Boarding School Healing Coalition. 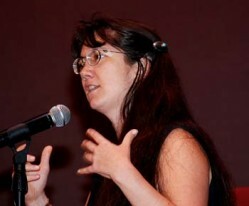 She is the author of Conquest: Sexual Violence and American Indian Genocide and editor of two Incite! Anthologies: The Revolution Will Not Be Funded: Beyond the Nonprofit Industrial Complex and The Color of Violence. She currently teaches at UC Riverside. Conquest: Sexual Violence and American Indian Genocide (South End, 2005) particularly Chapter One, “Sexual Violence as a Tool of Genocide” p. 7-33, and Chapter Seven, “Anticolonial Responses to Gender Violence” p. 137-175. Email the words “Register Me WATERtalks” to Cathy at waterstaff@hers.com. Thank you!